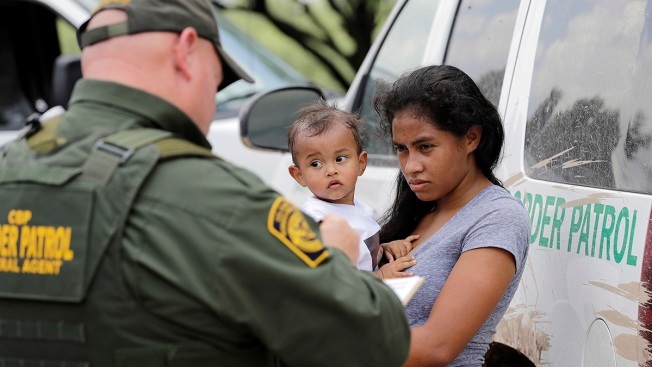 A mother migrating from Honduras holds her 1-year-old child while talking to U.S. Border Patrol agent after allegedly crossing the border illegally, June 25, 2018, near McAllen, Texas. The Justice Dept. says 54 children will be reunited with their migrant parents by the end of Tuesday at locations across the U.S. They will be set free in the U.S. pending the outcome of their immigration cases, which can take several years. That's only about half of the 100 or so toddlers the Trump administration has promised to reunite with their families. More than 50 immigrant children under age 5 will be reunited with their parents by Tuesday's court-ordered deadline for action by Trump administration, a government attorney said Monday. The families will be released after they are reunited. That's only about half of the 100 or so infants and toddlers covered by the order. At a court hearing, Justice Department lawyer Sarah Fabian acknowledged the government wouldn't meet the deadline for all the children, citing a variety of reasons, including that the parents of some of the youngsters have already been deported. Fabian said that 54 children will be joined with their parents by the end of Tuesday at locations across the country and that an additional five were undergoing final background checks. 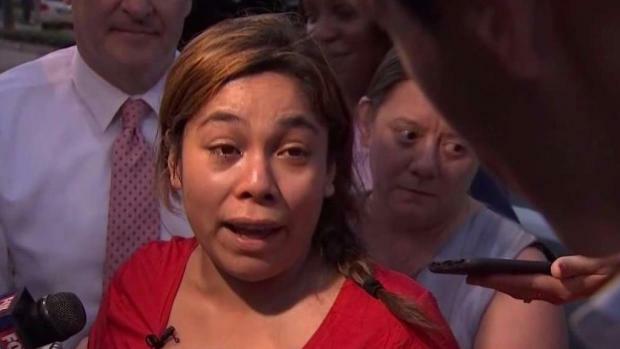 It was the first time the government indicated whether the parents and children would be released or detained together. They will be set free in the U.S. pending the outcome of their immigration cases, which can take several years. Fabian didn't say why they were being released, but U.S. Immigration and Customs Enforcement has little space to hold families. ICE has three family detention centers with room for about 3,000 people in all, and the places are already at or near capacity. The Trump administration is trying to line up thousands more beds at military bases. American Civil Liberties Union attorney Lee Gelernt told reporters he was "both pleased and disappointed" with the government's progress toward meeting the deadline. "Tomorrow there will hopefully be more than 50 babies and toddlers reunited with their parents, and that is obviously an enormous victory," he said. But he said those who remain split from their parents are "in for a long process." U.S. District Judge Dana Sabraw ordered both sides back in court on Tuesday to give another update and for him rule on differences over protocols to follow when reuniting children. The two sides revealed in a filing late Monday that they are far apart on protocols for reunification, with the government arguing its practices are necessary under federal law to ensure child safety and the ACLU contending that many are too cumbersome under the circumstances. One area of disagreement is DNA testing on parents and children, with the government saying it should be the general rule and the ACLU saying it should be done only when no other evidence is available to prove parentage. Other areas of disagreement include whether fingerprint checks should be run on other adult members of the household and parent participation a legal orientation program should be required before release. More than 2,000 children in all were separated from their parents by U.S. immigration authorities at the border this spring before President Donald Trump reversed course on June 20 amid an international outcry and said families should remain together. Late last month, Sabraw, an appointee of Republican President George W. Bush, set a 14-day deadline to reunite children under 5 with their parents and a 30-day deadline for older children. The 30-day deadline is up July 26. Monday's hearing set the stage for a dramatic day of reunifications on Tuesday across the country, though they are likely to occur largely outside public view. Fabian did not disclose where the reunions would take place. As for most of the rest of the under-5 children who have yet to reunited with their families, Fabian said that their parents have already been released into the U.S., have been deported, or are behind bars on criminal charges. One child has not been matched with a parent, Fabian said. The ACLU identified him as a 3-year-old boy. 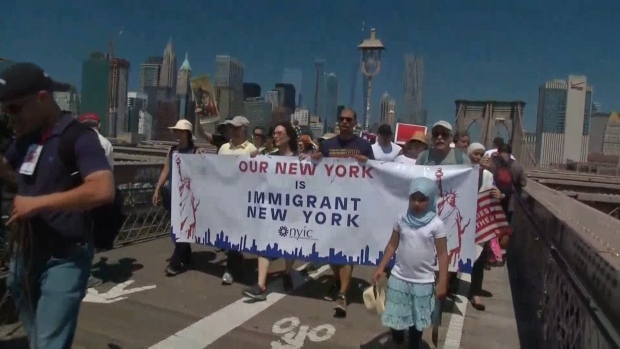 The hearing followed a feverish weekend of talks between the administration and the ACLU after the judge refused on Friday to grant a blanket extension to the deadline, saying instead that he would only consider certain exceptions.